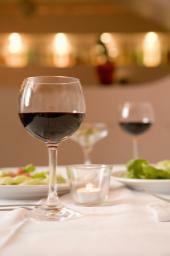 Research on red wine has honed in on an antioxidant called resveratrol. Resveratrol comes from the skin of the grape. Red wine is fermented longer than white wine so it contains more resveratrol.According to the Mayo Clinic, because of resveratrol, red wine appears to have more heart healthy benefits than other types of alcohol. Some researchers have found that resveratrol may be linked to a reduced risk of inflammation and blood clotting. How does red wine effect heart health? How much red wine do I need to drink? Moderation is the key factor; too much alcohol can have the opposite effect by raising blood pressure, triglycerides and leading to liver damage. For healthy adults, moderate drinking means one drink per day for women and men over 65. For men younger than 65, up to 2 drinks a day. One drink is defined as 5 ounces of wine. What about red wine and tooth staining? The best way to prevent or minimize tooth staining from red wine is good oral hygiene. A plaque-free mouth will help reduce the risk of staining.One of the best tools to help you and your patients keep their mouth plaque free is the Waterpik® Water Flosser. Researchers at the University of Southern California Center for Biofilms found that a 3 second application of pulsating water on medium setting removed 99.9% of plaque biofilm from treated areas.